Taco with Lots of Love. 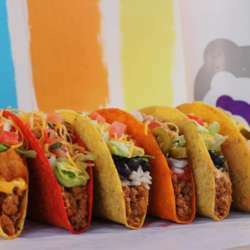 We finally know when America’s favorite “Mexican” fast food chain TACO BELL ( AND ADMITTED GUILTY PLEASURE) is opening their first store in Thailand: JANUARY. 24th !!!! So I am inviting a few members from the Protected content to join us for a fun lunch. Since they love fast food and don't know much about Mexican Food.... I thought it'll be a good idea to take them to one that's got a lot of Culture related and Success Stories behind them.....JUST TO EMPOWER THEM. SO LET THIS BE ANOTHER YEAR OF SHARING AND EMPOWERING ... LIKE ALL THE OTHER CHANGEMAKERS EVENTS! Since it can never be confirmed as to how many will 'actually attend' I can not reserve any table other than the one I will be sitting at. So we will go according to first come first serve basis. Plus it's fast food, so you just have to place your own order anyway.